So, this is a book of of words. And science. It is actually full of science words. And I understood most some of them! This is supposed to be a summary of astrophysics. A Sparknotes, if you will. A little taste to see if it’s to your liking, and if it is, you can pursue more on your own time. First we start out with a very tiny condensed ball of all of the stuff ever. Then it expands. 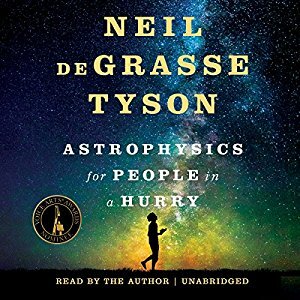 Our man Neil (deGrasse Tyson) explains the expansion in terms of time, such as a millionth of a second. Is that literal or figurative? Did time exist then? I have no idea! He talks about the pieces of stuff, like electrons and protons and other -ons, some of which I’m familiar with. At one point he goes into how we can decipher the makeup of a star by looking at the light it emits through a prism. He doesn’t really explain that part, and I kind of wish he did. How on earth (lol literally) does that work? Einstein came up with a thing. Then he thought he was wrong. Turns out he wasn’t. Dark matter. What is it? We have no idea! Dark energy. It’s a thing. The multiverse: maybe more than just a literary device used in comics and fanfiction! Then again, maybe not! Share the post "“The universe is under no obligation to make sense to you.”"
The great review dump has begun! I had similar brain confusing feels about this one when I listened to it. Did you audiobook this one too?